Congratulations to Brandon Bir! Our Coffee Sourcing and Education Director has been certified as a Lead Instructor by the Specialty Coffee Association. 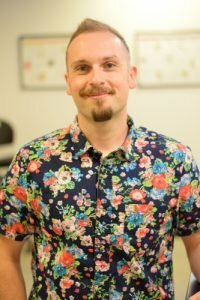 As a result, he is qualified to become a lead instructor or assistant instructor at SCA events and to teach professional coffee development courses on SCA campuses. Since Brandon started out as a customer experience specialist at Crimson Cup in 2011, his role has expanded to include direction of our cupping, coffee buying and education initiatives. Over the past few years, he has visited more than a dozen coffee farms in Central and South America, Africa and Asia to develop direct relationships with small-plot farmers and assist them with improving coffee quality. In 2016, he became one of only 3,500 coffee professionals worldwide to be licensed as a coffee Q Grader license and earned an SCA Coffee Taster Certificate. He was one of the first 31 graduates of the new SCA Coffee Buyer Pathway and holds Level 2 Certification from the Specialty Tea Institute. To achieve Lead Instructor certification, Brandon completed SCA courses in adult learning principles, instructional design, testing, evaluation and class management. Through our 7 Steps to Success coffee franchise alternative program, Crimson Cup teaches business owners, managers and their staff everything they need to run successful coffee businesses. This includes drink preparation and barista skills as well as guidance on everything from writing a coffee shop business plan and choosing a location to hiring staff and marketing the new business.